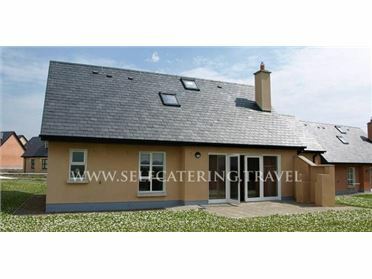 Hillview is a well-finished, modern property located on the outskirts of Castletownshend in the village of Fahouragh in the region of County Cork. Holiday Cottage has four bedrooms comprising one king-size double, one double, one bunk for adults, one single with a pull-out stacker bed, as well as one shower room and one bathroom, this cottage can accommodate eight people. The cottage also contains a kitchen with a breakfast bar with woodburner, a dining room, a sitting room with woodburner and a conservatory with seating. To the outside of the cottage is ample off road parking and a shared lawned areas. Located in the stunning countryside, Hillview is a beautiful location to explore the southern areas of County Cork and the coast. Castletownshend is a coastal village near Skibbereen in County Cork. The local attractions are the 17th century castle, the quayside and harbour. A few miles down the road, the town of Skibbereen offers a range of shops and restaurants, the West Cork Arts Centre and Skibbereen Heritage Centre. There is also a golf course, and an indoor sports centre. A terrific base for enjoying this part of Cork. Oil central heating with woodburners. Electric oven and gas hob, microwave, fridge/freezer, washing machine, tumble dryer, TV with Freeview, DVD, WiFi, and a selection of books and games. Fuel, power and starter pack inc. in rent. Bed linen and towels inc. in rent. Ample off road parking. Front gravelled garden with shared use of lawned areas. Sorry, no pets and no smoking. Shop and pub 1 mile.